A granular copper algaecide great for docks and swimming areas. 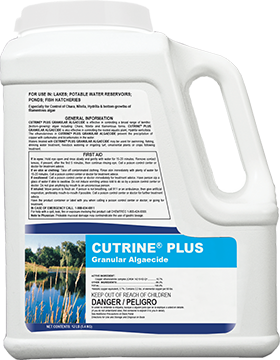 Cutrine-Plus® Granular is fast acting granular algaecide, formulated for the control of algae and chara. Cutrine-Plus® Granular contains the same active ingredient as Cutrine-Plus® liquid. For a more complete solution, we recommend using other pond weed control products to give your pond the healthy and beautiful look it was intended to have. Cutrine-Plus® Granular is a 3.7% copper algaecide that is suited for treating algae and chara. This granular algaecide is great for spot treating around docks and swimming areas, or for treating algae mats. Spread as evenly across surface of pond or spot treat algae mats as needed. An Algaecide/Herbicide ideal for planktonic and filamentous algae, Chara and Hydrilla. Cutrine Plus® Granular has no general water use restrictions at label rates. Read all products labels for complete instructions before applying products.